New Morning Star 200 Stick boxes in stock at Vectis Karma! Further to our Morning Star update in September, we can announce today that the new 200 Stick boxes for Frankincense, Myrrh and Sage are now in stock at Vectis Karma. 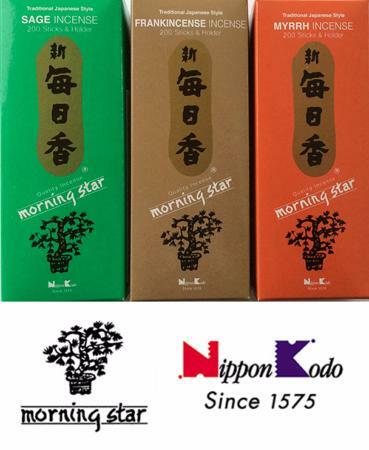 TheMorning Star range by Nippon Kodo continues to be extremely popular with our customers - and these new fragrances, launched last year, have proved so popular that they now feature in the 200 Stick size in addition to the original 50 Stick versions. All these, like all Morning Star 200 Stick items, are priced at £12.50 and includes Free shipping within the UK. For all other countries, shipping charges do apply. We now have a useful shipping fee calculator included in the shopping basket within our website - so you can easily see if charges apply, and if so how much. Morning Star Availability Summary: We currently stock 19 varieties of Morning Star Incense, in 36 options/sizes. See the full Morning Star range at Vectis Karma HERE.